Yes, true believer, this is how we end this story. So much for the goodie goodie White Light. But the next chapter begins right next week! Tying up lose ends after the craziness! Featuring cameos by Lumion, Kate Five, Abúi, Ultimate Power, Kaza and Mixtli. Prof Madison is the gal with the master plan! Please also visit The Beholder TUMBLR! … except: The characters of Jenny Everywhere, Jenny Nowhere, Jenny Anywhere, Jimmy Wherever and Jimmy Anytime are available for use by anyone, with only one condition. This paragraph must be included in any publication involving Jenny Everywhere, Jenny Nowhere, Jenny Anywhere, Jimmy Wherever and Jimmy Anytime, in order that others may use this property as they wish. All rights reversed. 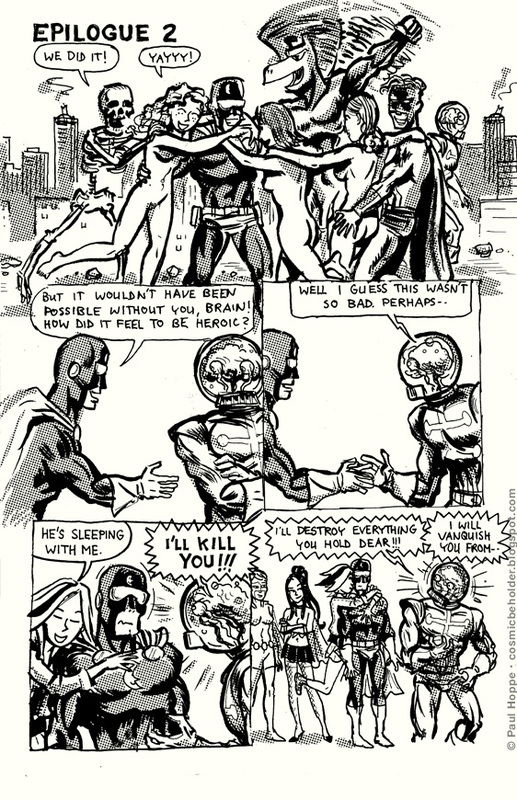 And: Earth-K, Anna Atom, and Max Atom were created by Michael P. and are available for use by anyone, with only one condition: This paragraph must be included in any publication involving Earth-K, Anna Atom, and Max Atom in order that others may use these properties as they wish. All rights reversed.